Firefighters provide a vital public service that people rarely think about until an emergency strikes. Excluding widespread natural disasters, firefighters respond to emergencies in their communities. Firefighters respond to fires and other emergencies such as traffic accidents, medical emergencies, and natural disasters. They drive fire trucks and other emergency vehicles to the incidents. Once there, they use the equipment on the vehicles and on their persons to address the situation. Firefighters work with paramedics, emergency medical technicians, police officers and emergency management personnel depending on the incident they face. For example, a building collapse will have firefighters pulling people from the fallen structure, paramedics and emergency medical technicians attending to injured people and police officers ensuring citizens do not get too close to the building and diverting traffic away from around the scene. Firefighters may attend to injuries as well since most firefighters are also certified as emergency medical technicians. Saving lives and property is the dangerous and glamorous part of the job, but there are other important aspects. Once an emergency situation is stabilized, firefighters write reports about it. Such reports keep managers within the department informed and help firefighters assess what went well and what could have gone better. In order to get the trucks rolling as soon as possible after the firehouse alarm sounds, firefighters clean and inspect their equipment on a routine basis. Problems and mechanical failures are prevented to the greatest extent possible so that they do not arise during an emergency. Firefighters conduct drills and participate in training to keep their minds and bodies in peak condition to fight fires and address other emergencies. They also share this knowledge with the public through speaking engagements and public demonstrations. Firefighters must also be able to act quickly under pressure, to connect hoses to fire hydrants, operate pumps to give power to water hoses, climb ladders and use special tools to break through any falling debris to rescue victims. Fire fighters may specialize in hazardous materials work or have special training to fight wildfires using heavy equipment and other methods such as digging fire lines. Although some firefighters do receive a salary, about two thirds of firefighters are volunteers, according to the National Fire Protection Association. A firefighter's salary varies based on geographic area, level of experience, education, and other factors. For most fire departments, a high school diploma will suffice. However, a college degree helps candidates advance to positions such as fire captain, and firefighters need to have certain licenses and certifications. College: An associate’s or bachelor’s degree can give someone an advantage in the hiring process, but a degree is not usually required. Licenses: A standard driver’s license is generally required. Once hired, firefighters will need to obtain the necessary license and endorsements to drive a fire truck and other emergency vehicles. Certifications: An EMT certification is required, but some departments allow new hires to earn this certification as part of the overall new firefighter training program. These programs are intense physically and mentally. Training: Because the new hire training program is so rigorous, firefighters do not need experience to be hired. There would be no practical way for someone to gain experience if it was required. Firefighting is such a unique job that the training has to come only once a position is secured. In addition to the new hire training, firefighters receive regular training in emergency management and the latest firefighting techniques and technology. Volunteer basis: Serving as a volunteer firefighter can help someone land a full-time job, but volunteering may be impractical given other demands on someone mid-career trying to change jobs. Many small-town and unincorporated area fire departments have only volunteer firefighters. They simply cannot afford to hire professional firefighters. Communication: Firefighters must be able to clearly and efficiently communicate under stressful and emergency conditions. Physical stamina and strength: Firefighters may need to move debris, carry heavy equipment, and carry or assist victims who cannot walk. They may also have to handle a heavy workload for extended periods of time. Courage: The job of a firefighter involves many dangerous situations, such as entering burning buildings or homes. Compassion: In addition to other support, firefighters must also be able and willing to provide emotional support to victims. 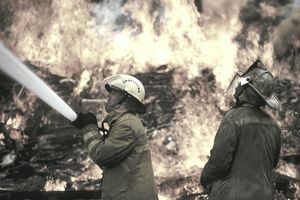 Decision-making ability: Firefighters are faced with life-or-death situations and must be able to make quick decisions. According to the U.S. Bureau of Labor Statistics, the outlook for firefighters over the next decade relative to other occupations and industries is average, driven by improved building materials and codes that have decreased fires, offset by open positions due to people leaving their jobs. Employment is expected to grow by about 7 percent over the next ten years, which is the same as the average growth projected for all occupations between 2016 and 2026. Growth for other fire-fighting and prevention jobs is projected to grow at the same rate, which is 7 percent over the next ten years. These growth rates compare to the projected 7 percent growth for all occupations. Job prospects will remain steady, even with volunteer firefighters filling some of the available jobs. Individuals with paramedic training and postsecondary firefighter education will have better job opportunities. Firefighters do not work a normal eight-hour day. They often work 24 hours straight followed by 24, 48 or 72 hours off. They may also divide their time between 10-hour day shifts and 14-hour night shifts. Like other civil service positions, the hiring process for firefighters has several tests built into it. Because of the physicality required at any moment on the job, firefighters must be physically able to meet certain benchmarks on physical tests in order to be considered for employment. Civil service exams and drug tests are also required to secure a job. Physical tests and random drug tests may be necessary for continued employment. Failure on one of these tests may be grounds for suspension or immediate termination. Interviewing may be part of the process, but will likely be one of the last steps before the hiring decision is made. It is easier for the department to disqualify someone using a standardized test than to choose between individuals based on an interview. To add a heightened aura of fairness, departments may employ panel interviews.